Because who am I to hide the fact that I’m trying to eat better and turn over a new, less-sugary leaf just like most of you? Truthfully, I think that something flips a switch in me each January that makes me not only want to eat healthier, but rather demands it. My body basically shuts down if I don’t start inhaling greens and vegetables regularly by the first week of January, and thankfully, I enjoy eating like that, so it’s not too much of a thing aside from a minor habit adjustment. I’ve been making kale salads for a long time now. I have innumerable variations on it, because kale can handle pretty much anything you can throw at it. So I like to load it up with things and go light on the dressing – mostly what I do isn’t even a dressing, but rather a little olive oil and a generous squeeze of lemon – and it always ends up being a really satisfying lunch or dinner. This one is a favorite of mine, and came about as an ode of sorts to this garlicky sun-dried tomato-smothered cauliflower dish that Katherine over at Eggton made many moons ago. I tried it the week it went up on her blog, and after a long day/night of writing with very little food in between, I tucked into it. And by “tucked into it,” I mean I accidentally ate the entire thing that evening. For dinner. And then late dinner. I made myself sick on it, basically, and although I don’t recommend that, I do wholeheartedly beg you to try it for yourself. It’s incredibly delicious and heart-warming and satisfying and I’ve probably made it 49 times since then. I typically eat it for dinner as a vegetarian main dish, but it would work wonderfully as a side to a protein or alongside a green salad. I would also love for you to try this kale salad I made for you. This is how I imagined her dish would be like deconstructed and strewn about some fluffy kale. If you’ve never made this type of salad before, you simply need to buy curly kale in bunches (please, no pre-washed bags if you can afford it; they’re never as good as the bundled sort) and pulse it down into ribbons in the food processor. Everything else goes in, and bang: beautiful salad minus any off-putting hunks of kale. It’s lovely, and kale does this magical thing where the relative weight of it keeps everything so evenly mixed throughout that you always get flavorful bites. Is this healthy? I say it is firmly healthy-ish. Certainly you can adjust things easily to increase the health / lower the calories like leaving off the goat cheese, for instance. 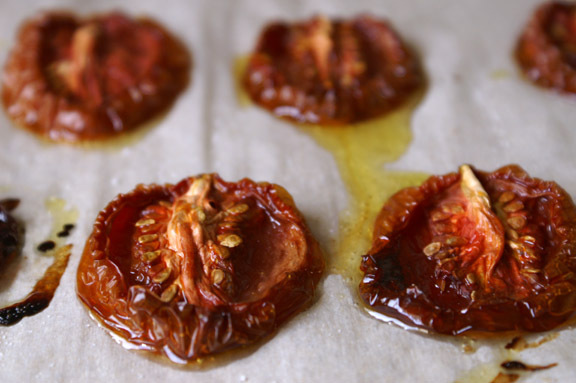 Obviously slow-roasting your tomatoes using my recipe is the way I suggest you go about this, but in a pinch, jarred sun-dried tomatoes work just as well, but since they’re packed in oil, that’s going to add some calories if you go that route. Whatever you do is perfectly acceptable: it’s your salad, after all, and I think kale was put on this earth to be messed with. If you are slow-roasting tomatoes (which I highly recommend you do, as you can make a big giant pan of them, use what you need, and then freeze them for later use), I’ll direct you to this recipe right here. It’s incredibly easy, but make them the day before, because slow-roasting in this case means a 10-12 hour stint in your oven. Inspired by Katherine’s obesssion-inducing cauliflower dish that I’ll never get out of my head, found here. *Olive oil in most recipes is adjustable: this one is no different. You may use less or more to suit your tastes. **The kale bunches I typically find in my local grocery have around 10 stems of kale in each, which is around 7 to 8 ounces of kale per bundle. You’ll need two of those bundles to make 4 salads. Preheat oven to 400˚F. Line a lipped baking sheet with aluminium foil. In a large bowl, toss the cauliflower florets with 2 tablespoons olive oil. Season with sea salt and ground pepper and toss again. Spread out on the baking sheet in a single layer and roast for 30 minutes, checking at the 20-minute mark for doneness. Leave it in until the florets are mostly golden with darker edges, tossing once or twice throughout the cook time. Remove from oven and set aside. Working in batches, add bunches of kale, roughly torn (don’t shove whole giant leaves in there) and pulse until kale is in small, ribboned pieces. Add the kale to a large bowl and pour remaining olive oil over top. Add the lemon juice and mix thoroughly. Season with a little sea salt and pepper. Add the grated Parmesan and mix to incorporate. Divide onto 4 plates. Add between 1/2 and 2/3 cup roasted cauliflower to each salad, then divide roasted tomatoes, walnuts, and goat cheese evenly between the plates. Season again with a little sea salt and pepper, and serve immediately. 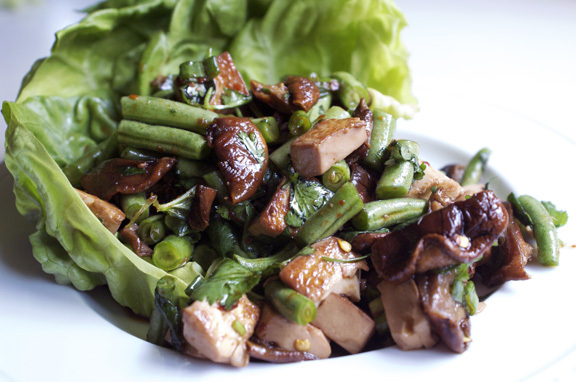 farmers’ market mondays: thai-style green bean, tofu + shiitake lettuce wraps. I’ve had cauliflower and chickpeas on my brain this week and now I’ll add kale! I need to get out of my routine. I always eat cauliflower just plain steamed (or roasted if I’m feeling adventurous) and I always saute my kale. This salad – particularly with the slow-roasted tomatoes – looks so good! I would happily stuff myself with it! And it’s a perfect example of hearty, healthy eating in January. I feel better just looking at it this morning, Shannon! Have a good Sunday! It’s okay, Elizabeth: I’ve seen what you do eat, and you’ve got a super broad, experimental palate: not liking kale is minor, and doesn’t everyone have something they don’t like that everyone else seems to? I don’t like wasabi: we’re even. 🙂 Although i’ll say it’s interesting you like cabbage and Brussels sprouts regularly, because they are very similar in flavor and smell (i know sometimes people will say the smell of all of those is off-putting, which i completely get). 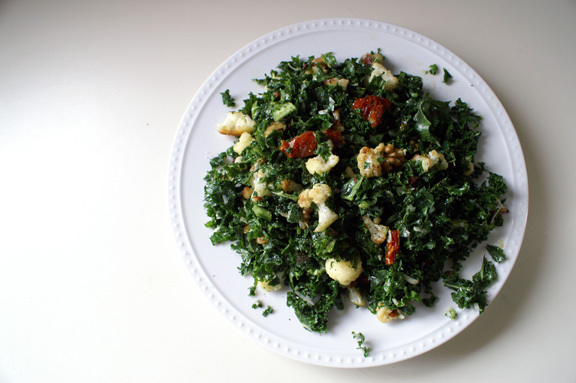 Start with the tomatoes and cauliflower, see you like it, and work up to kale someday. I know i’ve recently come to enjoy some things i thought i hated, so there’s always hope. And if you don’t, you don’t: i’d venture a guess that this combo over some Brussels sprouts may be delicious. Kale is such good stuff! And I love it in salads – it has wonderful flavor. And it’s quite easy to “shred” it with a knife (although the food processor does the job faster). 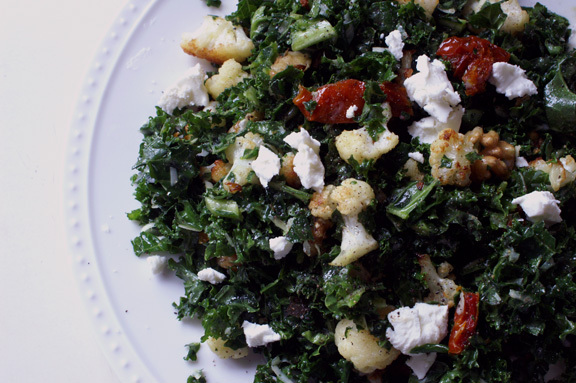 I roast tomatoes and cauliflower all the time, but never thought to combine then in a salad with kale – terrific idea. Really nice recipe – thanks. Picky daughter rarely eats kale salad but I might get her to try and change her mind with this appealing recipe! 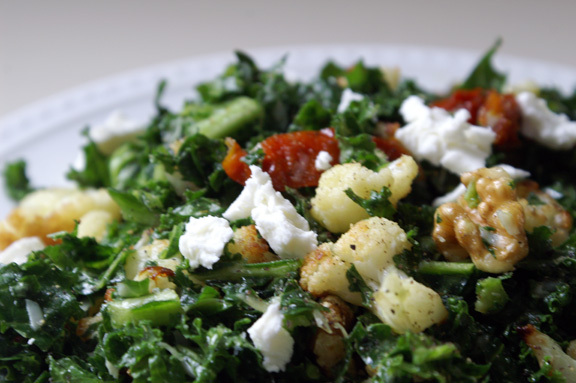 It hits all the right flavor notes as she adores roasted cauliflower and tomatoes. A delightful salad to begin the year with healthy eating! I seem to crave healthy foods in January too. I dunno if it’s wanting to start the year off right, or if it’s because this dull, dreary weather makes your body crave nutrients to perk it up. I wish they had healthy fast food because really the main reason I don’t eat healthier is because I don’t feel like cooking…and when you need an easy-to-grab food, it’s usually pretty bad for you, or at least not nutritious. I have to tell you that I always buy the pre-washed and chopped kale 🙁 I just don’t have the energy to deal with cutting the thick stem off EVERY leaf. Gosh, I’m annoyed just thinking about it. When you throw it in the food processor, you keep the stems on? Does it make them easier to chew? 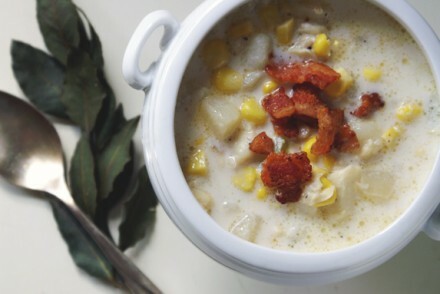 But anyway, I love everything in this recipe! Roasted tomatoes are too strong for me to eat on their own but when paired with lots of veggies, they’re so so good. I will definitely be trying this! Probably the same reason that everyone goes back/starts up at the gym: it’s change time, and you feel like you’re at a point where it’s now or never. Why, i don’t know, but it seems like lots of people do it. SO TRUE, btw, about how it would be nice to have healthier fast food options. Although, do you have a Panera? because i swore off Panera this year, and actually went to say goodbye to it with a breakfast sandwich in early january, and boom: WHOLE NEW HEALTHY, LOW FAT, CALORIES LISTED MENU. Not even kidding; if you have one, check it out. I’m making it a point to try all the new things here in the next few weeks. I used to buy the bagged stuff too? but there are still some pretty thick stems in the varieties around here, AND after a few times of the bagged stuff smelling really weird when i opened it? like rotten? I stopped…it freaked me out. I don’t leave the big lower stem part on: with this, no chopping by hand required, just tear the leaves off the thick stems. the smaller parts of the stem up top are okay; they get chopped in and you don’t notice them. Shredding it makes everything easier to chew: leaves and the top stem parts, yes. I have grown to like kale but I need to disguise it for Manservant. He can’t understand where kale has been all these years. He believes that spinach is good enough and that the spinach farmers must be feuding with the kale farmers. 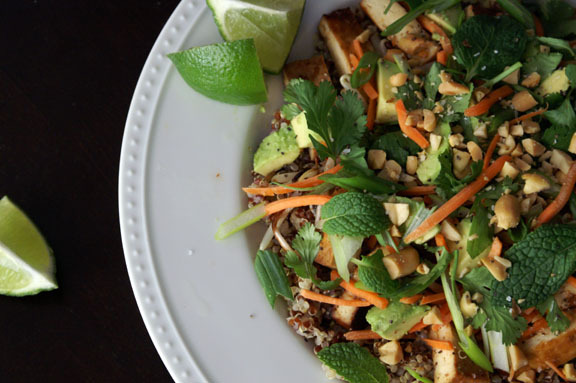 In any case, I do get to sneak it in sometimes and when I do, this salad will be at the top of my list! You know, Abbe, i was reading something the other day that said that kale was big in the nineties (really??!?) and that somehow it all but disappeared from shelves around 2000. Now it’s obviously back, and huge, but i don’t remember that first cycle of it. Mr. Table is the same: he won’t eat kale (except sometimes kale chips) but he’s cool with spinach…baby steps, right? I know just from reading the ingredient list that this is something I’d love. It looks delicious! Kale salads are my favorite. Have you been to Cleveland Heath on my side of the river? Please come with me – you’ll die for their kale salad! Anyway, the more I eat them, the more I crave them. I especially love them when I massage the lettuce and let it sit for a while. So good. I’ve been making all sorts of healthy/skinny recipes. I think my body was on sugar overload from the holidays and needed a bit of a detox. This kale salad looks perfect. I happen to adore kale, so I’m sure I’d scarf this right down. AH-GREE. I mean to not overdo it with sugar during the holidays, and although i think we did better than we ever have here at my house, it was still lacking in, shall we say, “health.” 🙂 not all the time, but i think every time we at correctly it was to counteract/prepare for the inevitable sweets, you know? I think detoxing a little bit makes us better at food anyway, come new years time: sort of cleanses the palate from the year before. The only kale salad I’ve been able to enjoy is an apple, pancetta, and radicchio one from Serious Eats. We make a big bowl of it and it’s all we eat for a couple days. SO good. Kale is so fibrous that I, with that one exception, can’t eat it raw. Last week I made a salad for dinner AND I WAS FULL. It was real weird. Maybe that will become a thing for me, because I felt so great after dinner. But I know so little about making salads (What goes in them? What goes on them?) that it’s kind of mortifying. I see a lot of mediocre salads in my future…unless I get a nice chunk of time to create a salad pin board and read all about the salads. Oooh, that DOES sound good: i’m googling that because i bet that’s spectacular. And salads are weird like that, right? You’d think it would be easy to think of combos on your own, but it’s not: I blank out most of the time when faced with creating a salad from scratch. Since i’m still high on new cookbooks from Christmas, let me link you to one that may help you in your salad quest: it’s one i got from Williams Sonoma. Evidently they have this whole series out of “_____ A Day” cookbooks that give you 365 recipes of something: soup, salad, vegetables, or dessert. I grabbed the salad one, and it’s FANTASTIC: way better than the one they had years ago, and way more creative in terms of what they do each day. It’s very seasonal and it’s well-organized, and i would totally recommend it. Here it is: http://www.amazon.com/Salad-Day-Williams-Sonoma-Recipes-Every/dp/1616282126 I mean, a YEAR of salads: what could be wrong with that? Nothing. So, just reading the recipe title made me start to salivate, is that good or bad? I do the same thing sometimes where my body NEED ALL THE VEGETABLES. And roasted tomatoes are pretty much the best thing ever. It’s my favorite way to use up those tomatoes that I know I’m not going to get to as they are rapidly passing their prime. Now I want to roast tomatoes and eat this salad and do all the things! Also, the ONLY way I can eat kale is if it’s shredded up like this salad does. Otherwise I feel like a cow I’m just chewing forever and ever the end. I know you love the kale as much as i do, so that’s good! I love roasted tomatoes, too: i’m running low, and I sort of can’t wait to run out, get more tomatoes, and roast up a new batch? because, TOMATO SMELL IN THE HOUSE. I’m the same with kale: huge leaves equal nonstarter: i think it’s why it took me so long to really “like” kale, because i never got why anyone would want to eat big fat chewy green things. I am so ready for a salad like this. Normally I’m just like you — the first week of January hits, and I’m ready to be done with the heavier foods and move on to fresh salads and smoothies. This year, however, things went a little off course, and I’ve actually had a difficult time getting myself back on track. I’m ready, though. I’m so, so ready, and this salad sounds perfect. I adore kale, and slow-roasted tomatoes, and walnuts, and goat cheese… and I especially love that you dressed it so simply with just olive oil and lemon juice. Yes, yes, and yes! Hey, everyone on their own time frame, right? We got sidelined around here with a few bouts of illness, so it took us a minute to get back on track as well: it certainly didn’t begin january 1, that’s for sure. Don’t be too hard on yourself; we all treat it like a magical wonder-date, but it isn’t. You know, i actually tried to get super-creative with the dressing on this one, and every time i tested it, it fell short of the whole lemon juice/olive oil dressing i normally use on my kale salads, so why mess with a good thing, i say. 🙂 Sometimes frilly dressings take away from all the flavors, anyway, and the lemon sort of lifts up the roasted things, which tend to be super earthly. it’s a decent contrast. Here’s my problem: my body wants to detox with all sorts of healthy foods, but my tastebuds still clamor for cheese-carbs-sugary-bad-for-you-in-all-ways-ness. Meaning I make salads, but usually don’t even eat a whole serving. Then I’m discouraged for a few days or weeks and try again. But this! This promises to keep me interested, maybe even polishing off a whole bowl and coming back the next day!!!! And to maintain our psychic tummy connection, I made roast cauliflower last night….but am switching it up from the usual (cover in spices, roast, eat) by making a parsley-lemon puree (from Bon Appetit). I am excited…about veggies! it’s hard, right! I *neglected* to mention that at night, the sugar/sweet cravings kick in big time, although over the past few weeks, it’s gradually gotten less. Habits are habits, period, and sugary ones are the hardest to get rid of. Try this one, because you’re right about interesting salads: if there’s big flavor in them and lots of things to keep you entertained, then i think they do the trick. And the tomatoes in here combined with the goat cheese make for a semi-sweet little combo that may satisfy you more than a normal, carrot and cucumber filled salad (which wouldn’t do it for me right now, either). oh that sounds WONDERFUL! parsley-lemon puree?!? i bet that’s amazing. I actually have about half a cauliflower left over…that may be my dinner tonight. i’ll look it up. OMG yum! I’m always astounded at blogs and magazines that are like, “Kale is over!” Not in this house, it isn’t. I can’t wait to try this recipe – those tomatoes look amazing. Gotta love magazines and their declarations, right? How ludicrous…kale is not a peasant blouse, you know? it’s GOOD FOR YOU so quit telling people it’s over and let people like what they like. SO exceedingly dumb when food magazines and blogs try to be Food Vogue. Looks like we tied on number of squares eaten in our households, then; everyone needs a little recovery after that, as delicious as they are. I feel good knowing we’re all in the same post-holiday boat, as usual. I’d like to make a peasant blouse out of kale. I think it’d work well, be light and flowy, but also fibrous and supportive. Can’t say I’ve made it to the healthy kick side of the equation, but it does feel good not reaching for a cookie every twenty minutes, raising said cookie like a glass of champage, and cheers-ing with a hearty chorus of “COOKIES!” Yeah, that feels pretty good. Haha! A peasant blouse made out of kale! A super food blouse. Awesome. i think you’re right! very durable, but not weighty at all. and a pretty color, i might add. everyone in their own time frame, i think; you can’t push yourself into things like eating healthy, you have to totally want to or it won’t stick. Besides, it sounds like you’ve made some headway by not having 3 cookie toasts per hour, right? baby steps. the just one question project: question three.